Forgot your username and password? It will be strength vs. strength on a Louisiana Saturday night. But who has the edge? The irresistible force vs. the immovable object. The cliché has been used time and time again for football games between high-powered offenses and mean, nasty defenses. We’ll get this year’s college football version of that game on Saturday night in Baton Rouge, when No. 1 Alabama visits No. 3 LSU. The Crimson Tide are no longer a team that just dominates with defense. They sport the best offense in the country this season with a 54.1 points per game average – more than four points higher than any other FBS team. Alabama is currently on pace to be the highest-scoring offense in the modern era of college football. Its opponent on Saturday night ranks No. 7 in the nation in points allowed, as LSU has only given up 15.1 points per game through its first eight contests. Alabama has yet to play a team currently ranked in the top 30 in scoring defense. It will be strength vs. strength on a Louisiana Saturday night. But who has the edge? It’s incredibly difficult to find flaws in either unit, so I turned to recent history to see if that was an indication of what to expect in Tiger Stadium this weekend. I first found the 10 games from 2008-2017 between the Power Five team with the highest-scoring offense in the country and the opponent they faced with the highest national ranking in scoring defense. I then looked at the midpoint between the great offense’s season average and the great defense’s season average, and compared that number to how many points the great offense actually scored against the great defense. If the actual number of points exceeded the midpoint, then the great offense “won” the battle. If not, the great defense did. This is a very simple analysis, as it does not account for such things as overtime, defensive scores, and the amount of garbage time, but it gives us a benchmark to point to for what we can expect from Tua Tagovailoa and the Crimson Tide offense against Dave Aranda’s stingy Tigers defense. On average, the offenses got the better of the defenses by 4.1 points per game in those 10 contests from 2008-2017. 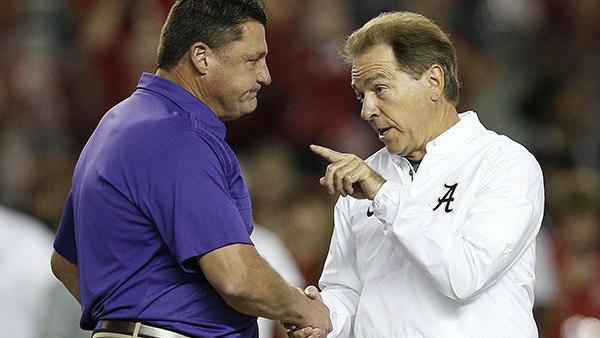 Using that average as a predictor for Saturday night, Alabama would be expected to score 39 points against LSU, as the midpoint between the two units’ averages is 34.6. The Crimson Tide getting to 39 points seems reasonable. Alabama isn’t going to maintain its 54 points per game average through November with Mississippi State’s and Auburn’s defenses still to come, but averaging 39 against those three teams would keep its season average right around 50 points, making it the highest-scoring non-Big 12 offense of the past decade heading into the postseason. The more pertinent question is what does allowing 39 points mean for LSU’s chances of winning the game? Given the Crimson Tide have allowed 39 points just twice in the past five seasons (a 42-35 loss to Ohio State in 2014 and a 43-37 loss to Ole Miss in 2015), they’re probably not good, especially given this LSU offense ranks dead last in the SEC with just 5.3 yards per play. The recent history of the series isn’t kind to LSU either. The Tigers have maxed out at 24 points this decade against Alabama (2010), and were shut out the last time the Tide came to Baton Rouge in 2016. The good news? This might be the worst Crimson Tide defense, relatively speaking, in that stretch. To put a bow on this, if Alabama’s offense “wins” the battle against the LSU defense, and the Tigers offense reaches their decade-high against the Crimson Tide defense, we would have a score of Alabama 39, LSU 24. Most sportsbooks currently favor Alabama by 14.5 points, so that result would be right in line with expectations. When in doubt, history shows to take irresistance over immovability. It also shows to just take Alabama and not worry about it. Matt Smith - Matt is a 2007 graduate of Notre Dame and has spent most of his life pondering why most people in the Mid-Atlantic actually think there are more important things than college football. He has blogged for College Football News, covering both national news as well as Notre Dame and the service academies. He credits Steve Spurrier and Danny Wuerffel for his love of college football and tailgating at Florida, Tennessee, and Auburn for his love of sundresses. Matt covers the ACC as well as the national scene. See who the SouthernPigskin gang, Terry Bowden and Bill Curry picked this week. The Steak 'n Shake SoCon Power Poll is a ranking of the teams from the Southern Conference. A new experience in College Fantasy Football. Draft teams, not players. SouthernPigskin.com covers the SEC, ACC and SoCon with a purely southern perspective on the sport that defines us. Check us out! Part of USA Today Sports Media Group.